The January-05 issue of International Musician ran the following article as a Product Spotlight. The article was then posted online in Making Music Magazine. 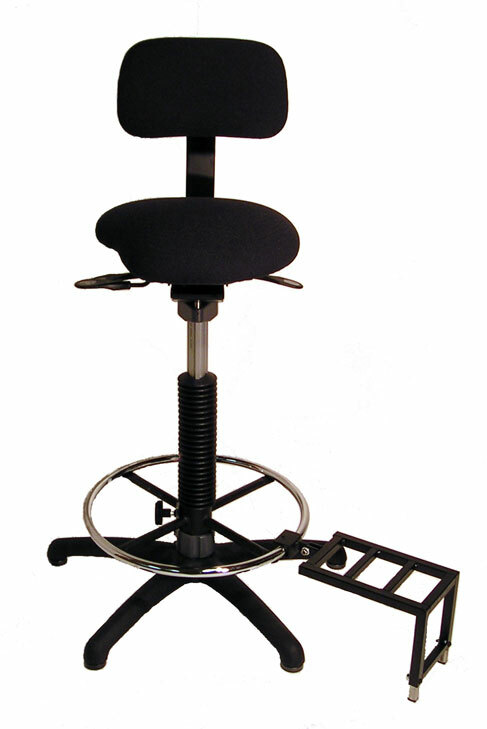 To be truly ergonomic, a performance chair must be non-swivel and feature height, seat gradient, and back support adjustments, firm padding on the seat with waterfall curved front edge (to cushion the arteries in the back of the legs to offset any constriction), and a small back support that can be positioned directly into the lumbar. The Concert Design Concert Basso has all these features and more. Concert Basso performance chairs boast quick, quiet height adjustment by gas shock. The seat adjusts to a seven-degree forward slope, while the removable back, which can be positioned right at the lumbar, adjusts vertically and horizontally and won’t conflict with arm movement. All components are industrial strength for long life and minimum maintenance. The design and capability of the Concert Basso reflect invaluable comments and ideas received from bassists, such as Local 92 (Buffalo, NY) member Paul Bresciani, principal bassist with the Buffalo Philharmonic Orchestra. "We searched for new bass chairs for two years," says Bresciani. "When we found the Concert Design Basso, we knew immediately this was what we wanted. Our entire section whole-heartedly endorses the Concert Design Basso."